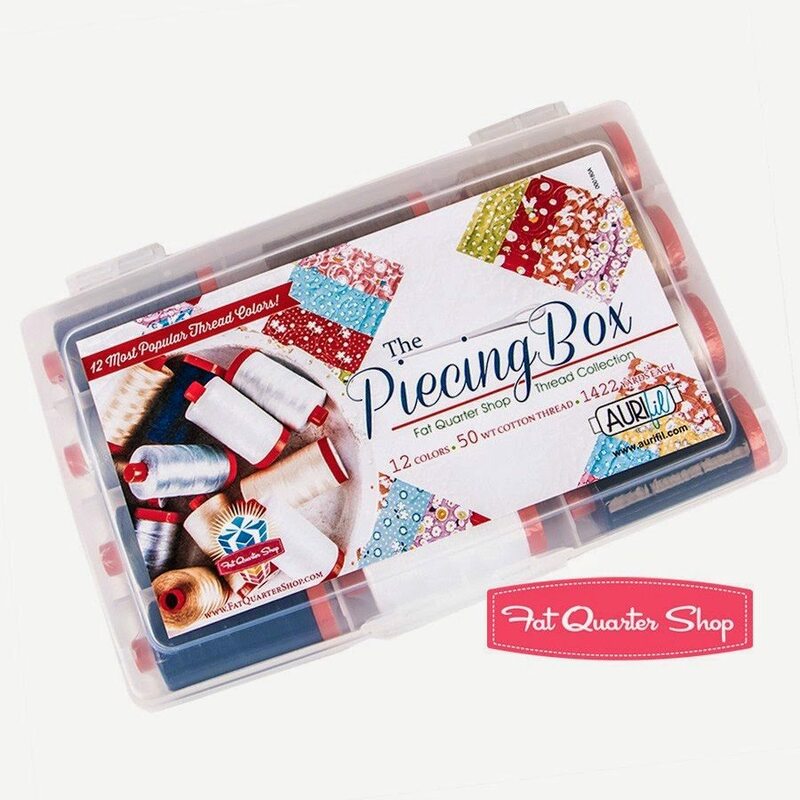 The Fat Quarter Shop and Aurifil have teamed up to bring you ‘The Piecing Box’. 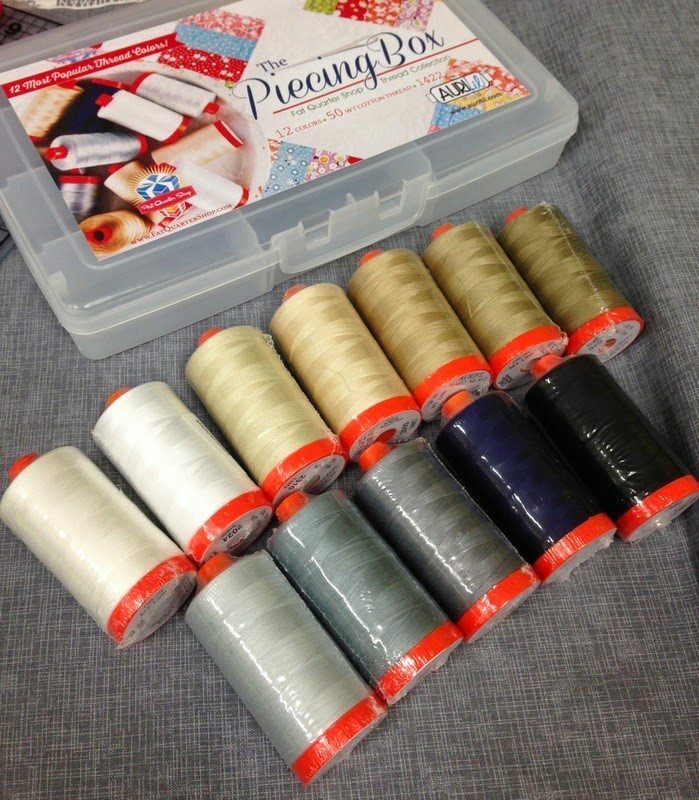 I think they should rename it to ‘The Perfect Piecing Box’, as the 12 chosen threads conveniently combined in a case for easy access and storage, are your go to threads for most piecing. These colours / shades will match or blend in with a majority of fabric combinations. The 50wt thread is the perfect weight of cotton for piecing as it helps the seam lie flat. White 2024 for brilliant white fabrics and the off white 2021 for your ‘not so’ whites. 2000, 2310, 2326, 2325 and 2370 are brilliant neutral threads which blend in with an array of fabrics. The greys 2600, 2610 and 2605 are again great blenders with a multitude of fabrics. Black 2692 and Navy 2784 are for your dark blues and black piecing. I like to use Navy in the bobbin when piecing black in case I have to unpick (gasp!) so I can see the stitches. Why stop at piecing. I am a fan of using 50wt neutrals to quilt, especially very dense designs with overstitching. Dove 2600 and the olive / golds work well with multicoloured fabrics where it is hard to chose one thread. They melt into the quilt. The Piecing Box is exclusive to the Fat Quarter Shop. While you are there, check out all the other Aurifil threads and box sets available. The box sets are great value per 12 – 50wt 1300m / 1422yd spools. This is a great idea – and I like your point about using them for quilting too. I'm often at a loss as to what colour to use when I need to quilt across both light and dark fabrics. In fact, I've chosen some rather ho-hum quilting patterns to avoid sewing over both fabrics in the past! and yes so true, what a great collection and I do so much piecing, this is something I would benefit from so much too. Oh, these look great! And I agree, they should rename the box to perfect.